As one crew gets used to Earth’s gravity after 172 days in space, another crew is preparing to launch to the International Space Station in just over two weeks. Expedition 48 Commander Jeff Williams arrived in the United States just 24 hours after landing Tuesday evening in Kazakhstan and completing his mission. 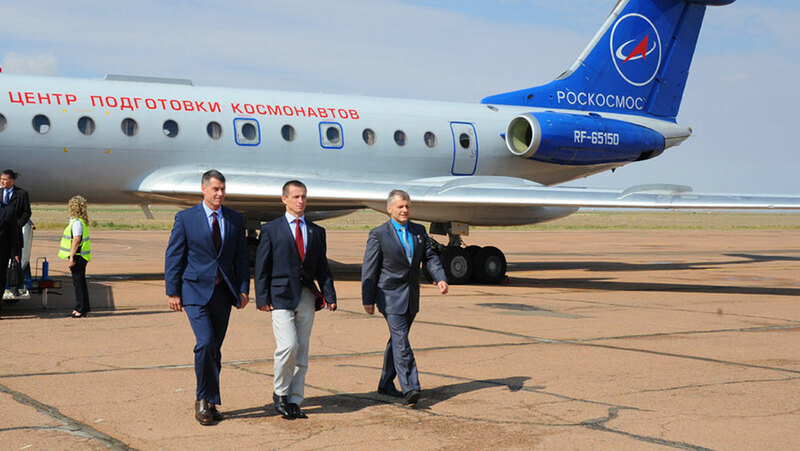 His Expedition 48 crewmates Alexey Ovchinin and Oleg Skripochka, who were seated next to each other in the Soyuz TMA-20M spacecraft, have returned to their home space agency Roscosmos in Russia. Williams has completed one shuttle mission and his third station mission accumulating 534 days in space – a NASA astronaut record. They will soon be replaced by another trio of Expedition 49-50 crew members who have arrived at their launch site at the Baikonur Cosmodrome in Kazakhstan. NASA astronaut Shane Kimbrough and cosmonauts Sergey Ryzhikov and Andrey Borisenko will launch Sept. 23 on a two-day trip to the space station. They are in final preparations for a mission scheduled to last until Feb. 25, 2017. Back in space, the Expedition 48-49 crew consisting of Commander Anatoly Ivanishin and Flight Engineers Kate Rubins and Takuya Onishi are continuing science operations and maintenance of the orbital laboratory. Rubins continued more DNA sequencing work today and inspected emergency equipment. Onishi cleaned ventilation fans and measured air flow. Ivanishin worked on the Pilot-T experiment exploring how a crew member adapts to the working conditions of a long-term space mission. why do you guys always replace a trio? Right now the Soyuz vehicles that launch crews to the station can only launch three people at a time. Crews stay in space for an average 5-6 months at a time. When one crew leaves the station, that leaves three people in space to continue station operations. About two weeks later, another trio launches to return the station to a full capacity of six crew members.